Pilgrims who continue to Cape Finisterre traditionally strip off at the beautiful end point. What they do for the walk back is anyone's guess. 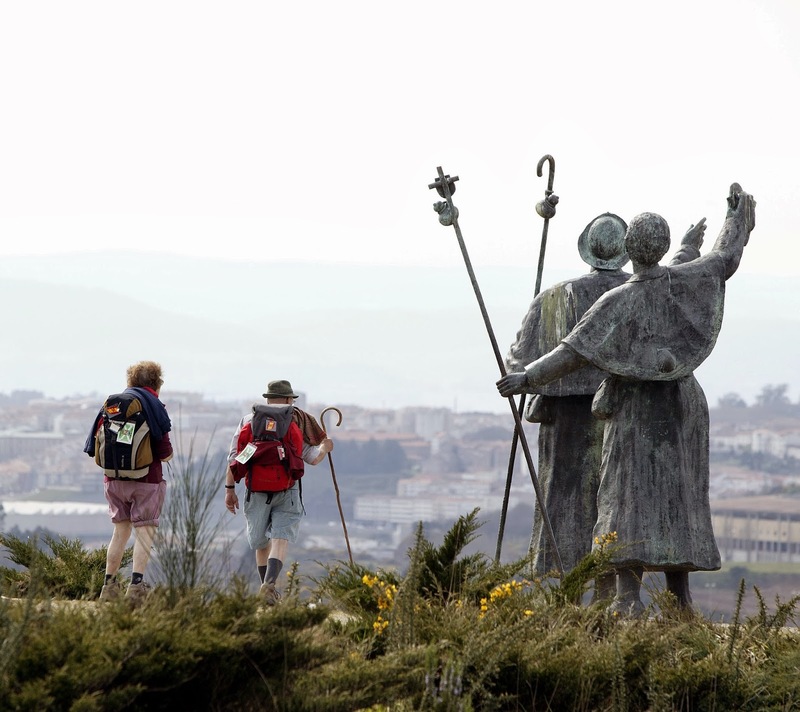 It's always a little embarrassing when someone asks if I've 'done' the Camino de Santiago. This is because while, technically, I have been there and, even more technically, I have walked it, the process took less than ninety minutes. Yes, my pilgrimage in its entirety took less time than it takes to watch Elf. That said, I did spend a good few days in the region sussing out different routes, hostels and (ahem) vineyards. So while I can't profess to know much about blisters, walking packs or how to avoid that annoying person you pick up on your first day, I can give you some good ideas for how to tackle the infamous pilgrimage. If I were ever to complete the Camino de Santiago, I would definitely do it on a bike. Sure, you lose a few cool points by not trudging mile after mile, and you have to travel a little further to get your certificate, but you do get to cover more ground and work up some speed. You'll probably miss out on some chats with fellow pilgrims, but this may not be a bad thing. And cycling is a great way to clear the head, so don't let anyone tell you it's any lesser than walking. Followthecamino.com have packages from Burgos to Ponferrada, which takes seven days. How cool would this be? When you pass the other pilgrims, you won't be speeding past them on a bike, but trotting past them, aloft your stallion. Possibly waving a handkerchief. Walk the Camino have a horseback which costs £1,800 for 7 days. Sure, you can walk the Camino and do what most other pilgrims do - find a hostel each night, eat the same thing at dinner, and start walking at dawn. But if this doesn't quite take your fancy, then you can stay in boutique hotels, enjoy fine dining and luxuriate a little. Have a look at the Superior Collection on Caminoways.com for packages including stays at cute country cottages. I wrote about this trip recently as part of a big family holiday feature, and think it's a fantastic idea. You and the kids will take to the bikes for the last 100km stretch of the camino, covering the last section of the famous French Way from Sarria. You'll cycle around 20km a day (a perfectly reasonable distance, though you'll want to make sure that everyone's able) and stay at a family friendly hotel each night. Let's get down to basics. You're not looking for the bells and whistles of an aided tour. You just want to pull on your boots, get walking and do this alone. And the good news is, it's easy (not the actual walking part, you understand, but the practicalities). You'll just need to decide on your route, break in your boots, and set to it. The facilities for pilgrims along the route are outstanding, with hostels spread at perfect intervals. They cost between €5 - 15 per night, and are all regulated by the Camino. You'll arrive to a dorm room bed, a shower, and plenty of other pilgrims to compare notes with. The variety of accommodation along the way is outstanding - you'll find quaint little stone buildings, monasteries and more. Finding food isn't a problem either - most have set dinners for pilgrims. Don't eat the famous octopus, whatever anyone tells you. Do eat everything else in sight - you've earned it, and Galician food is divine. Be sure to try some of the local Albariño wines - Paco & Lola is a beautiful choice, and easily found. Look out for the funky dotty bottle.